from Ash :: I think if our friends weren’t so nice…we may have been on the chopping block :0) Not because our dishes were subpar (of course), but because ALL the dishes were absolutely delicious! SO…after driving my sister (who was cat napping on the couch all day with Jack) and Mark crazy with all the recipe ideas we came up with an avocado coriander egg white salad wrap (inspired by Martha) and a chocolate avocado pudding with a vanilla meringue and sage infused berry compote (sounds fancy, tasted fancy, looked….well, anything but fancy). 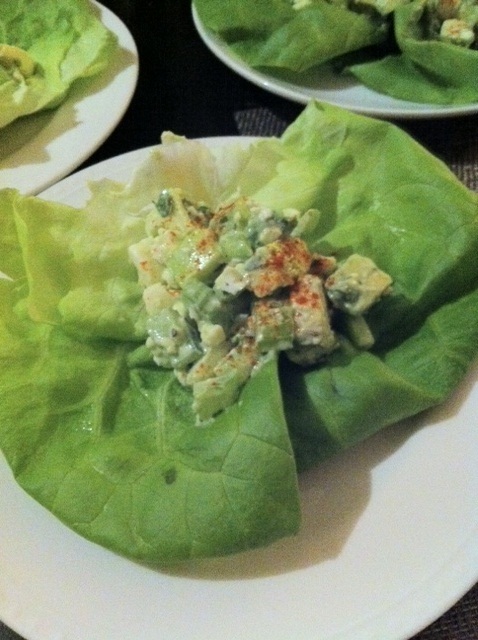 I will definitely make the salad wraps again- they were awesome! As for the desert…I am not sure how I feel at the moment…so lets not talk about it. You just add all the ingredients in a bowl (with the exception of the butter lettuce and paprika), toss and then serve on the lettuce leaves with a bit of paprika for coloring. Looking back…we could have taken it to the next level and added some lemon prawns in the mix (small to medium)– good idea for next time!